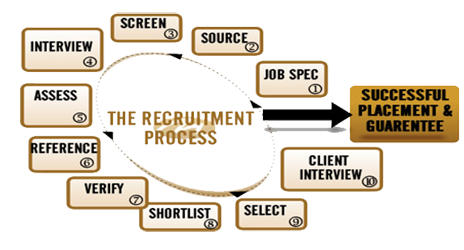 Recruitment refers to the process of attracting, screening, selecting, and onboarding a qualified person for a job. At the strategic level it may involve the development of an employer brand which includes an "employee offering". Consult In India Recruitment Solutions is a first of its kind recruitment company in India which has drawn an internal team from the recruitment industry. We are also well complimented with a domain strong team capable of delivering services of highest quality to our clients and offer end-to-end support in identifying the best available resources. Consult In India has a dedicated team of domain experts delivering quality recruitment solutions and is the fastest growing Recruitment Business in the entire country and has successful recruitment practices across industries, servicing leading MNC & Indian organizations.